All our wieners are made using only good quality pork and beef; no by-products and no soy or plant extenders are used. As well, they contain no added monosodium glutamate. They are smoked using natural wood chips; no artificial chemical sprays or dips are used to obtain the smoke flavour. As with most of our products, we recommend heating the product prior to portioning to retain the natural juices and flavour. Pork and beef, Water, Modified milk ingredients, Modified corn starch, Salt, Sodium phosphate, Dextrose, Spices, Sodium erythorbate, Sodium nitrite, Smoke. This product is fully cooked and requires heating only. 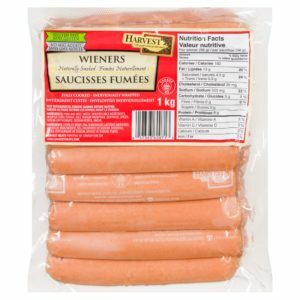 Each wiener is individually wrapped for freshness – remove outer casing before heating. Barbecue, roast, microwave, steam, or boil.